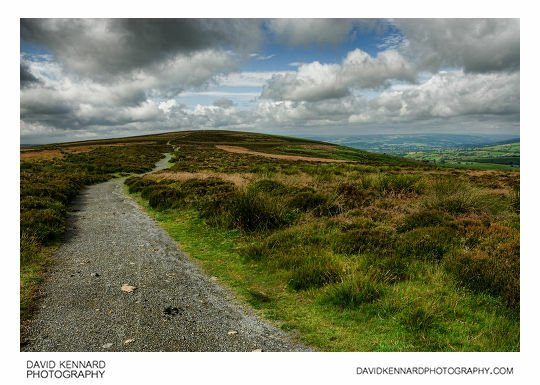 The Long Mynd is a long mountain in Shropshire, near the borders with Wales (the name Long Mynd means Long Mountain). 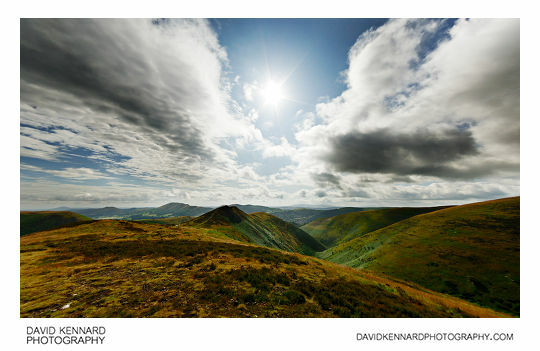 I visited the Long Mynd back in July while on holiday with my family in Shropshire. The most popular area is at the bottom, in Carding Mill Valley. But there is a road going up the Long Mynd from Church Stretton, and a couple of car parks at the top as well. We went up the Long Mynd in the car and parked in the Shooting Box car park at the top. We stopped partway up though to admire the spectacular view over Church Stretton, now quite a way below. 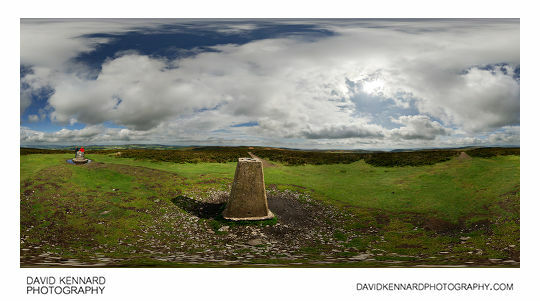 The above pano (and the one further below of Pole Bank) took me ages to create. 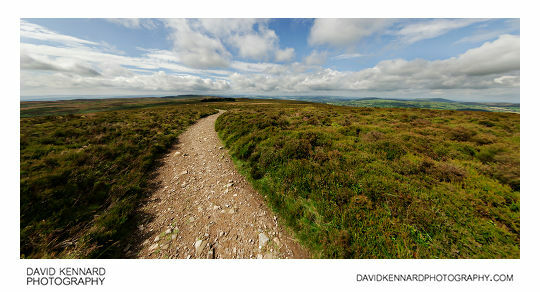 Initially both panos gave a bad stitch around the horizon, so I manually added control points around the horizon. But because the shots were handheld and bracketed ±2EV in 1EV steps, it took me about 1 day for each pano just manually adding these control points, which was a very tedious job. And then after all that work, they still didn't stitch very well around the horizon and needed a lot of work in Photoshop to fix. 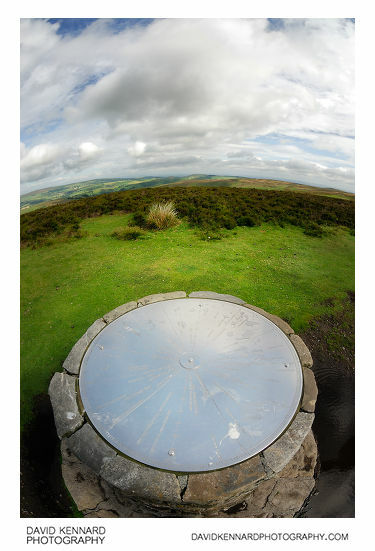 Until we got to Pole Bank, the highest point on the Long Mynd. At Pole Bank as well as the triangulation pillar, there's also this interesting big metal disc, with lines pointing in all directions showing the distances and directions to various places. 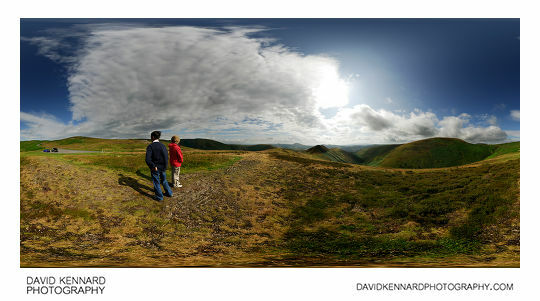 Then we walked back along the path along the top of the Long Mynd. We walked on a short way past the Shooting Box car park where we had parked, and the found the Shooting Box. The Shooting Box is a Bronze age Burial mound that used to have a Grouse shooting hut built on top of it. I would have preferred to visit the Long Mynd early in the morning or late in the evening when the light would have been softer and warmer, but you have to work with what you've got. I found that a lot of my photos turned out very flat, so I played with the post processing, trying out different HDR programs and also Topaz Adjust, to try and improve them. 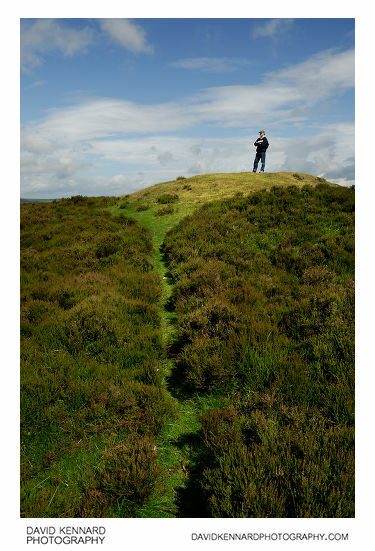 More info on the Long Mynd: Wikipedia, National Trust, Educational information produced as part of Telford & Wrekin's Grid for Learning, in association with the National Trust. After our walk along the Long Mynd, we went back down the hill to the small town of Church Stretton below.